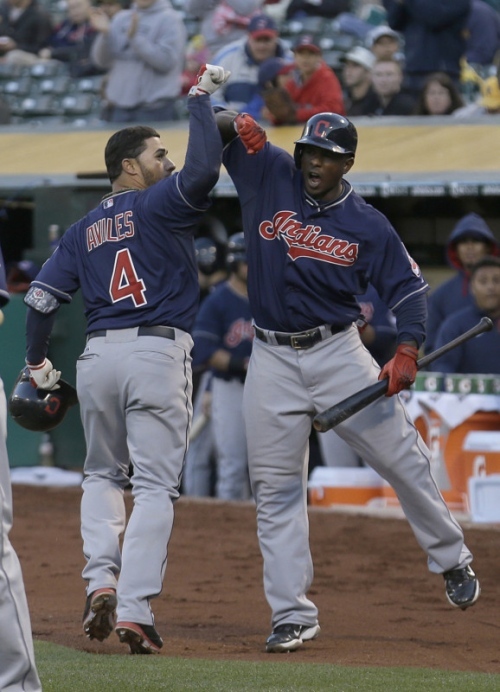 The Cleveland Indians did an effective job in taking two-of-three from Oakland to open the 2014 Major League Baseball season. While the Tribe left in late in both wins – scoring twice in the ninth in the first game and three times in the ninth in the third game – they got things done when they needed to. Justin Masterson looked primed for a big contract year in the season opener, holding the A’s to just three hits and no runs over seven innings. If he keeps pitching like that, the Tribe will be happy, even though each successful start brings Masterson closer to the type of big-money contract the Indians have no way of matching. We can’t say the same for Corey Kluber and Zach McCallister, who struggled in Wednesday’s double header. Kluber lasted just 3.1 innings, giving up eight hits and five earned runs in a 6-1 loss. It was his first loss in 13 starts dating back to June 27 of last season. McCallister wasn’t much better, going just four innings while giving up six hits, three runs and walking four in the nightcap. … but the bullpen wasn’t. The Tribe had to rely on its bullpen and with the exception of Vinnie Pestano, the guys came through. Marc Rzepczynski, Cody Allen, Scott Atchison, Blake Wood, Bryan Shaw and Josh Outman combined to throw nine innings of shutout ball during the series. New closer John Axford was also two-for-two in saves. Axford’s save in the opener wasn’t pretty, to be sure, as he walked two batters, allowing the A’s to have the tying run at the plate. (We’ve seen that before, Tribe fans.) But he worked his way out of, so it’s all good. As weird as it sounds, the scoreless inning that Axford threw on Monday was the first time in his Major League career that he did not allow a run in his inaugural appearance of the season. Wins are wins, but about the offense. The offense did just enough, and not much more, during the series. Six of the Tribe’s nine runs were scored in the ninth inning, and the team hit just .147 with runners in scoring position, with Jason Kipnis (0-for-6), Asdrubal Cabrera (0-for-4) and Mike Aviles (0-for-3) the biggest non-contributors. The Indians also stranded 26 runners during the series. Hopefully they can get those numbers turned around because that is not going to cut it for very long. Some things just have no explanation. Both of the Tribe’s wins were off of Oakland closer Jim Johnson, who is now 0-7 with a 7.94 ERA and five saves in 17 career appearances against Cleveland. Any chance someone can convince the Tigers to trade for him? So far, so good with Santana. Carlos Santana made two starts at third base during the series, and while he made an error, he also threw out Derek Norris at the plate on a nice play. Overall, Santana kept his name out of the news for his play in the field, which is exactly how Francona and Santana like it. Weather permitting, the Indians open a three-game series on Friday with Minnesota. It will be the first of 19 games (yeah unbalanced schedule!) against the Twins this year.